The rise of America’s gun. Gaston Glock had no experience with firearms when he set out to design his first pistol in the early 1980s. The Austrian engineer—who managed a radiator factory in suburban Vienna, and produced curtain rods, military knives, and bayonets in his garage—didn’t even own a gun. But his first model, the Glock 17—made primarily out of injection-molded black plastic—earned him a twenty-thousand unit contract with the Austrian Army. Though Glocks were initially perceived as ugly and inexpensive-looking, it didn’t take long for law enforcement and civilians alike to recognize that they were accurate and exceptionally reliable. Three decades later Glock dominates the handgun market, so much so that “Glock” has come to mean “gun.” And because a Glock can fire more rounds without reloading than a traditional pistol or revolver, it has become notorious for its role in mass shootings, utilized by Jared Lee Loughner in Tucson (2011), among others. So it should be no surprise that the Glock has been at the center of debates about gun control going back twenty-five years, and has long played a prominent role in Hollywood movies, on TV crime shows, and in the lyrics of rappers (like those of Tupac Shakur, who was killed by shots fired from a Glock). To this day, though, few people know anything about Gaston Glock, a reclusive octogenarian who survived an assassination attempt in 1999 and has oft-stated his intention to live to 120. Paul M. Barrett aims to change that with “Glock: The Rise of America’s Gun” (Crown), a new book that provides an inside account of how Mr. Glock became the late twentieth century’s Samuel Colt—another handgun inventor who had a catchy one-syllable last name and knew how to market a weapon. How did a man who had no experience with handguns create the most popular handgun in the world? Gaston Glock’s lack of experience with firearms allowed him to start with a clean sheet of paper, picking and choosing the best design ideas suggested by leading firearm experts of the day. Glock served as a general contractor, combining these ideas and creating a prototype. He had no commitment to particular design approaches, and having never participated in the firearm industry, he had little to lose. What process did Gaston go through to create the original Glock pistol? When he learned that the Austrian Army was looking for a new pistol to replace its World War II-era Walther P38, he went out and purchased all of the best known brands: Sig, Beretta, and so forth. He took those models apart and studied their inner workings. He visited the Austrian patent office to look at other pistol designs. He also sat in on police training sessions to learn about law enforcement priorities. He also constructed a firing range in his basement to test his creation. He fired only with his left hand; that way, if the prototype blew up, he would be able to continue the drafting process with his right hand. Why have Glocks been perceived to be better than the handguns of competitors? The original Glock pistol had an unusually large ammunition capacity [17 rounds], which compared to eight or ten rounds in a typical semiautomatic pistol or six rounds in a conventional revolver. The gun’s receiver [the lower portion, including the grip and trigger assembly] was fabricated from industrial strength plastic, often referred to as polymer. This material made the Glock more durable and lighter than firearms made from steel and wood. The Glock also had a radically simplified safety mechanism—specifically, it lacked an external safety lever or de-cocking device. In this sense it was less complicated than other semiautomatic pistols and functioned more like a revolver: remove from holster, point, and shoot. The Glock safety resembles a mini-trigger within the main trigger. This so-called trigger safety has to be depressed for the gun to fire. It prevents accidental discharge if the gun is dropped. But it means the gun is always “on.” If the user depresses the trigger, the gun fires, no matter what. Finally, the Glock has a very smooth, consistent trigger pull. Most other double-action semiautomatic pistols have a heavy initial trigger pull and then a very light pull on all subsequent uses. The Glock’s steady, light trigger pull tends to make most shooters, especially novices, more accurate. When and why did American police officers get interested in carrying Glocks? Timing was crucial. In the mid-1980s, American police chiefs saw their officers being “outgunned” on the streets. Drug crime—particularly cocaine-related gang violence—was on the rise. At the time, almost all American police used Smith & Wesson revolvers, which many cops believed were no longer adequate. And the fact that the Austrian pistol was lighter was important to cops working an eight-hour shift. How did American civilians learn about the Glock? American gun owners like to buy what their local cops are carrying, so that was one big advantage for Glock. Controversy was another big selling point. Gun-control advocates attacked the newfangled Austrian pistol as soon as it showed up in this country. They claimed that because it was mostly plastic, the Glock would be “undetectable” by airport security machines and would be adopted by hijackers. Congress held hearings. The New York Police Department banned the gun by name in New York. But it turned out that the allegation about X-ray machines was untrue. Meanwhile the gun received tons of headlines and attention on the television news. And it became the darling of the NRA, which defended the Glock against what turned out to be false attacks. The commissioner of the NYPD at the time was carrying a Glock under his suit jacket as his personal gun, and soon most New York cops were carrying it, too. How did Glock make it to the Big Screen? Appearing in TV shows and in major movies was yet another way that Glock captured the imagination of Americans. Once the police began carrying Glocks, Hollywood prop men started “casting” the brand in television shows like Law & Order and Hollywood blockbusters like Die Hard. Bruce Willis, Arnold Schwarzenegger, Tommy Lee Jones, and other action heroes helped popularize the Glock by referring to it in their movies. Why did the Glock develop a reputation for being tough and menacing? 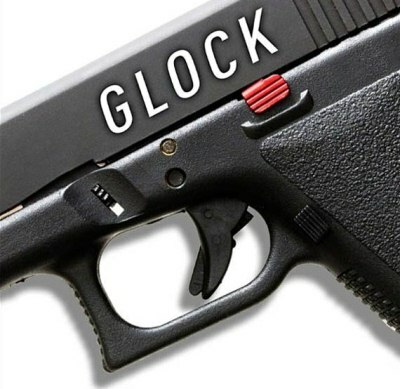 Glock became the brand symbolizing both law and order and crime. That’s a great way to sell guns. A lot of the bad-guy image came from “gangsta” hip-hop. Rappers liked the look and tough sound of the Glock. Also, the name rhymes with “cop,” “drop,” and, most importantly, [slang for] a certain part of the male anatomy. Once Tupac Shakur and Snoop Dogg started rapping about the Glock, it was bound to take off. Is it true that Glocks became popular with criminals? Some Glocks did show up at crime scenes. But the Glock’s reputation as a crime gun was always larger than the reality. It’s relatively expensive—$600 at retail in a gun store—and most stick-up artists prefer throwaway guns known as Saturday Night Specials. But mass killers have been known to use Glocks, right? Glock has proven popular with psychopaths who want to get off a lot of rounds very quickly. The first mass killing involving a Glock took place in 1991 at a Luby’s in Killeen, Texas. More recently, the killer in the Tucson attack on Congresswoman Gabrielle Giffords used a Glock 19; six people were killed. Does the large ammunition capacity of the Glock make it more dangerous? In the hands of a crazed killer, yes. In fact, gun-control advocates launched an offensive against the Glock in the wake of the Killeen massacre, and the assault-weapons ban of 1994 included a provision limiting magazine capacity to ten rounds. That meant Glock had to stop selling new guns and magazines with more than that amount. Did the assault-weapons ban damage Glock’s business? Quite the contrary; the magazine-capacity law worked in Glock’s favor. First, the law contained a loophole: All guns and magazines manufactured before the effective date in 1994 were “grandfathered” in. So Glock ran the factory at full tilt and built up a huge inventory of “pre-ban” product. When the ban took effect, the price of those guns skyrocketed, leading to huge profits for Glock. Second, Glock was able to continue to sell to the police, who were not covered by the assault-weapons ban. Third, Glock frequently did trade-in deals with police departments which resulted in former police weapons ending up on the used-gun market. Fourth, Glock introduced several smaller models, known as Pocket Rockets, which complied with the ammo restriction. In the end, the legislative attempt to stifle Glock and its large magazines had very little effect. Then, in 2004, the law expired by its own terms, and the NRA blocked its extension. Today, Glock can once again sell pistols with as many rounds as its customers might want. In the wake of Glock’s success, have other manufacturers tried copying their guns? If you go to a gun-industry trade show, you’ll see that most of Glock’s competitors, including Smith & Wesson, make guns that are essentially Glock knockoffs. It’s a Glock world, and the rest of the handgun industry has to live in it. Why did American companies like Smith & Wesson fall behind in the arms race against Glock? Smith & Wesson, Colt, and other American gun manufacturers companies grew complacent, neglected innovation, and allowed quality to deteriorate. In much the same way that U.S. car companies lost market share to the Japanese and Germans, American gun companies saw Glock (and Italy’s Beretta and Brazil’s Taurus) eat their lunch. Gaston Glock was the victim of an assassination attempt in 1999. What happened? Glock discovered that his top financial adviser, a Luxembourg-based shell company artist named Charles Ewert, had been taking advantage of his position to siphon millions of dollars from the company. When Glock traveled to Luxembourg to confront Ewert, it turned out that the financier had hired a former professional wrestler [Jacques Pecheur] to try to kill him. A bizarre encounter in an underground parking garage ensued. Strangely, neither the hit man nor Glock had a gun. When the hit man tried to knock Glock out with a rubber mallet, Glock, seventy years old at the time, overpowered his attacker. The financier and the hit man were convicted and sentenced to long prison terms. How has the loosening of restrictions on carrying guns affected Glock? The loosening of restrictions, which has been going on for more than twenty years, has greatly benefited Glock. The company has led the way in marketing smaller guns that are marketed as ideal for “concealed carry.” Glock has proven very effective in responding to marketplace trends. It’s one of the company’s hallmarks. Have gun-control advocates given up on trying to curb sales of the Glock? No, but they have never had much success. Plaintiffs’ lawyers and some municipalities have sued the company, saying that its high-capacity, easy-to-shoot handguns are more likely to cause accidents and/or be used in crime. But generally speaking, the lawsuits haven’t stuck. Glocks malfunction occasionally, as all guns do, but they typically do what they are designed to do: fire with deadly force. Is Gaston Glock still alive? He’s in his eighties and lives in southern Austria but is very secretive and no longer makes public appearances. He has made hundreds of millions of dollars, lives in a luxurious villa on a lake, and flies on his own corporate jet and helicopter. The company remains privately held, and his children are now involved in running it.